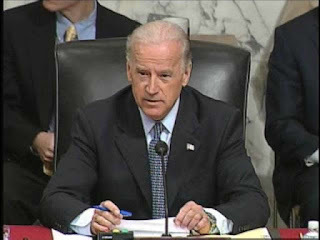 WASHINGTON (The Nil Admirari) - Earlier today, Vice President Joe Biden announced he would not run to be the Democratic presidential nominee in 2016. Biden cited a phone call "from some great friends on Wall Street," who told him former Secretary of State Hillary Clinton had already won the Democratic Party's contest to be Wall Street's puppet in the White House. "So these very nice people on Wall Street basically told me Hillary Clinton was already owned and operated by them. They have given her a lot of money, and she is going to owe them big time if she becomes president," stated Biden, who winked at the press. Biden added, "If I had been a little faster making my decision on running for president things may have been different. It would possibly be me having to owe Wall Street big time." RELATED: Biden: No Presidential Run, Americans "Too Stupid to Vote for Me"
"It looks like I will just have to help Hillary by sniping at Bernie Sanders during the primaries, and whoever her Republican opponent is during the general," said Biden. "That way, Uncle Joe gets some favors repaid by President Hillary Clinton," explained Biden.